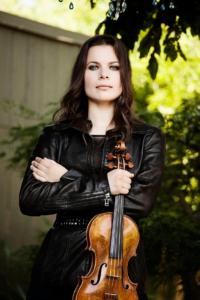 Acclaimed for her passionate, powerful performances, beautiful sound, and compelling command of her instrument, violinist Bella Hristova is a young musician with a growing international career. The Strad has praised, “Every sound she draws is superb,” and The Washington Post noted that she is “a player of impressive power and control.” Ms. Hristova’s 2017-2018 season features her characteristically rich and wide ranging musical life. She will perform and record Beethoven’s 10 Sonatas for Piano and Violin in a nation-wide recital tour presented by Chamber Music New Zealand, with acclaimed pianist Michael Houstoun. Ms. Hristova also performs standard concerto repertoire and those by American composers Lukas Foss, Samuel Barber, and David Ludwig, appearing with the Chautauqua, Austin, and Milwaukee symphonies, among others. As part of her busy and varied career, she performs recitals and chamber music throughout the U.S.
Ms. Hristova has performed extensively as soloist with orchestra including with Pinchas Zukerman and the Orchestra of St. Luke’s at Lincoln Center, with the New York String Orchestra under Jaime Laredo at Carnegie Hall, as well as with the Buffalo Philharmonic Orchestra, the Pasadena, Charleston, Asheville, Greenwich, Vermont, Kansas City, Delaware, Columbus symphonies and Orquesta Filarmónica de Boca del Río, Asturias Symphony Orchestra, Centro Nacional de la Música-la Orquesta, Estonian National Symphony Orchestra, Canada’s National Arts Centre Orchestra, and Korea’s Cheongju Symphony Orchestra. She has performed recitals at Merkin Concert Hall, the Kennedy Center, the Isabella Gardner Museum in Boston, the Weis Center for the Performing Arts, the National Museum of Women in the Arts, the Alys Stephens Center for the Performing Arts, Free For All at Town Hall, the Shanghai International Music Festival, and Seoul National University. Her recording, Bella Unaccompanied (A.W. Tonegold Records), features works for solo violin by Corigliano, Kevin Puts, Piazzolla, Milstein, and J. S. Bach. A proponent of new music and composers, Ms. Hristova commissioned iconic American composer, Joan Tower, to compose “Second String Force” for Unaccompanied Violin, in 2015, which she premiered and performed in recitals throughout the US and abroad.